1. Open the PT Activity. Perform the tasks in the activity instructions and then answer the question. Which routers are the DR and BDR in this topology? 2. A network engineer has manually configured the hello interval to 15 seconds on an interface of a router that is running OSPFv2. By default, how will the dead interval on the interface be affected? The dead interval will now be 60 seconds. 3. 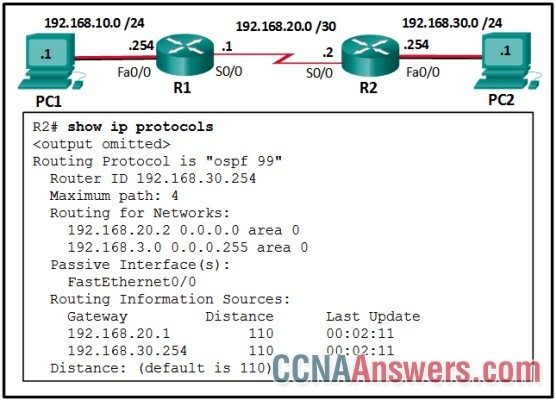 Which OSPF feature allows a remote OSPF area to participate in OSPF routing when it cannot connect directly to OSPF Area 0? R2 receives default route information from another router. Route 2001:DB8:CAFE:B001::/64 is a route advertised by an ABR. Route 2001:DB8:CAFE:4::/64 is advertised by a router three hops away. 5. Refer to the exhibit. Directly connected networks configured on router R1 are not being shared with neighboring routers through OSPFv3. What is the cause of the issue? The no shutdown command is missing on the interfaces. 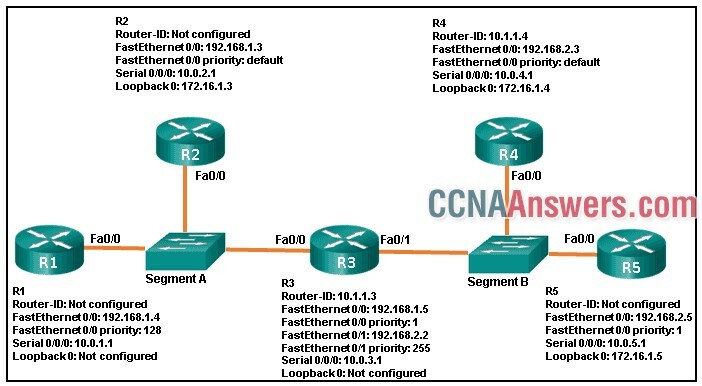 There are no network statements for the routes in the OSPF configuration. There is a mismatch of OSPF process ID in commands. 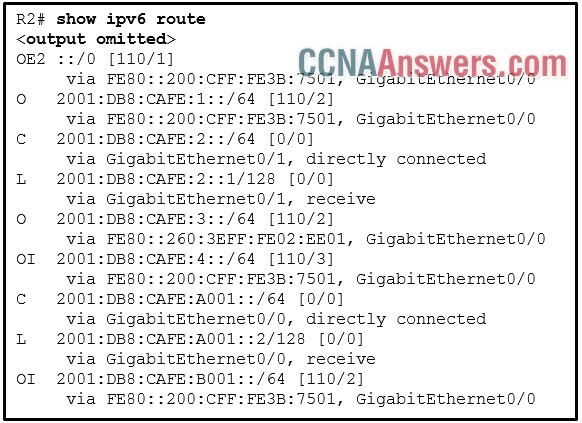 IPv6 OSPF routing is not enabled. 6. An administrator is troubleshooting OSPFv3 adjacency issues. Which command would the administrator use to confirm that OSPFv3 hello and dead intervals are matching between routers? Use the ipv6 ospf priority 10 command on the interface g0/2 of RT1. 8. A network administrator has just changed the router ID on a router that is working in an OSPFv2 environment. What should the administrator do to reset the adjacencies and use the new router ID? 9. 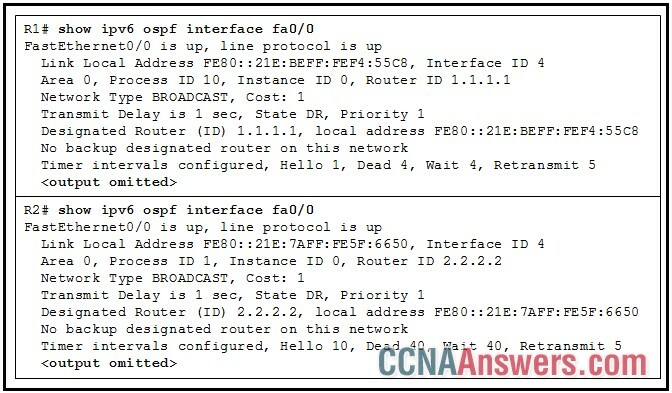 Which command can be used to view the OSPF hello and dead time intervals? 10. A network administrator is troubleshooting an OSPFv3 configuration on an IPv6 network. The administrator issues the show ipv6 protocols command. What is the purpose for this command? 11. Refer to the exhibit. 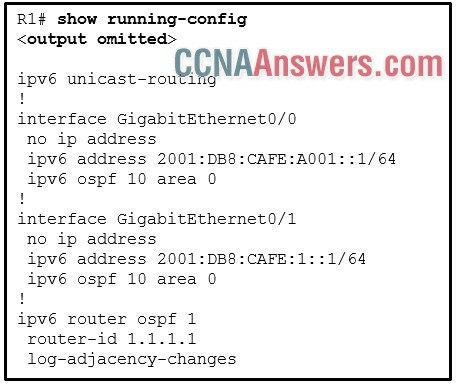 A network administrator has configured OSPFv2 on the two Cisco routers but PC1 is unable to connect to PC2. What is the most likely problem? Interface Fa0/0 has not been activated for OSPFv2 on router R2. Interface Fa0/0 is configured as a passive-interface on router R2. Interface s0/0 has not been activated for OSPFv2 on router R2. Interface S0/0 is configured as a passive-interface on router R2. There have been 9 seconds since the last hello packet sent. The router ID values were not the criteria used to select the DR and the BDR. The DR can be reached through the GigabitEthernet 0/0 interface. 13. Refer to the exhibit. What the amount of time that has elapsed since the router received a hello packet? What information can be gathered from this output? The metric for this route is 110. The edge of the OSPF area 0 is the interface that is addressed 192.168.16.3. The route is located two hops away. This route is a propagated default route. R2 is BDR for segment A.
R5 is BDR for segment B. 17. 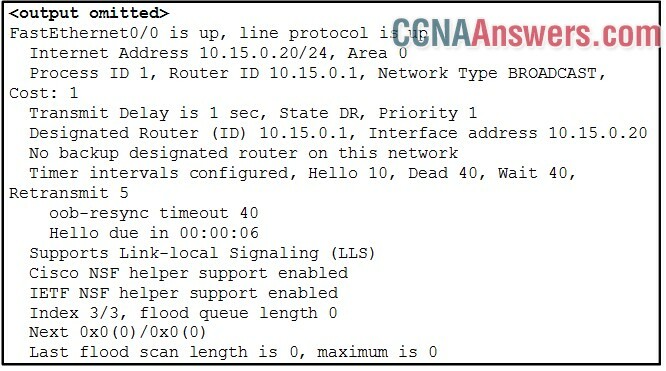 Which command will a network engineer issue to verify the configured hello and dead timer intervals on a point-to-point WAN link between two routers that are running OSPFv2? 19. Refer to the exhibit. A network administrator is configuring OSPF for R1 and R2, but the adjacency cannot be established. What is the cause of the issue? The area ID is misconfigured. 21. Refer to the exhibit. Which conclusion can be drawn from this OSPF multiaccess network? If the DR stops producing Hello packets, a BDR will be elected, and then it promotes itself to assume the role of DR.
With an election of the DR, the number of adjacencies is reduced from 6 to 3. All DROTHER routers will send LSAs to the DR and BDR to multicast 224.0.0.5. When a DR is elected all other non-DR routers become DROTHER. 23. Refer to the exhibit. R1 and R2 are connected to the same LAN segment and are configured to run OSPFv3. They are not forming a neighbor adjacency. What is the cause of the problem?